I've driven the Fiat 500. I've driven the Fiat 500c. 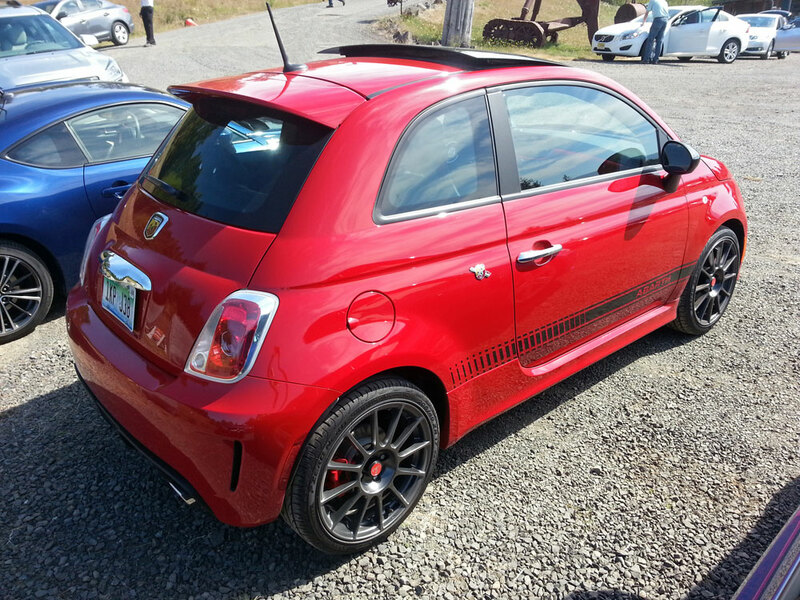 I finally got a chance to drive the Fiat 500 Abarth yesterday at the annual Northwest Automotive Press Association's Run to the Sun event. It almost goes without saying, but this 500 is a completely different animal from the non-turbo variants in most respects. Obviously there's the exterior differences. Front fascia, side skirts, wheels, Abarth badges. Audibly, there's the exhaust note, oh the exhaust note! With it's twin tailpipes, the Abarth lets out a gurgling, popping, deep tone that sounds mean. You can hear the turbo whine, too; music to my ears. Inside, the Abarth you get the same upright seating position as the other 500 models, but you get different, sportier seats. While better than the standard model's seats, I still had a hard time finding that just-right driving position. This car also has a boost gauge, moon roof, and, black and attractive red stitched upholstery. This was the first 500 I'd driven with a manual transmission. The shifter feels a bit sloppy; you can move the leaver around good 1/2 inch when in gear, and the shifts aren't the most precise. The knob felt a bit too big in my hand, too. And although that might sound odd, it simply did. When it came time to put the 160 hp 1.4-liter turbocharged MultiAir engine to work, work it does. 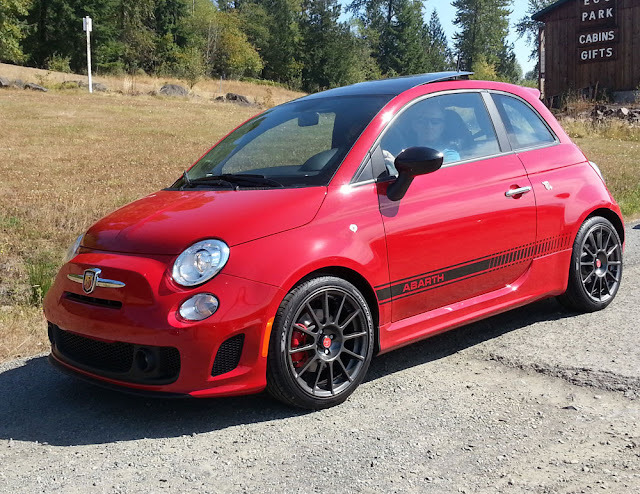 The Abarth will easily light up the front wheels into a symphony of wheelspin, turbo whine, and exhaust note that is truly a sensory experience. 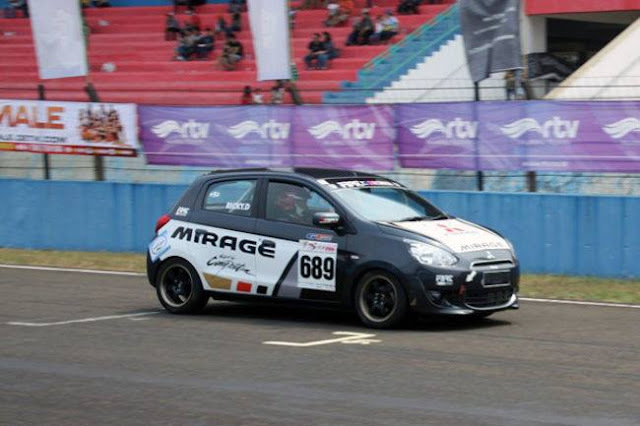 The car pulls hard through the gears, and has plenty of power whether passing on the highway or cruising the freeway. You can hear the exhaust drone a little at 70, but it's unobtrusive. Sadly, most of my time with the car was in a straight line on Interstate 5. However, the few curves I did take showed the car would certainly be a competent corner carver. The unique electronic stability control (ESC)-controlled differential helps to keep wheelspin in check during those curvy moments. But as one other journalist put it, with the seating position as upright and high as it is, the car feels like it's going to roll into all corners. The good news is it won't. In fact, it's quite the opposite, it'll stick very well. I hope to get some more time behind the wheel of the Abarth, as it is certainly a fun hot hatch. 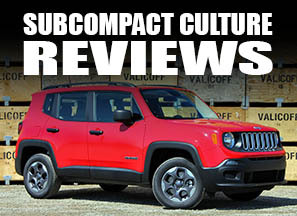 And while this scrappy hatchback may have its shortcomings, it's packed with personality and a good bit of power, too.